Former Great Britain forward Phil Clarke believes a close contest between his two former teams is crucial for the future of the World Club Challenge. Sydney Roosters are taking Sunday's game against Wigan seriously as they seek a fourth world title, but not all NRL teams are as enthusiastic and the match only took place in 2018 because Leeds were prepared to make the trip to Melbourne. "It needs the Super League sides to play at their very best to be competitive," Clarke said. "We can't afford a 40 points to two result at the end of this. "We need the game to be close and competitive to make sure the other NRL sides still buy into the concept." The Roosters, who are currently in camp in Paris preparing for Sunday's game at the DW Stadium, are favourites with the bookmakers, but Wigan made the most of home advantage two years ago when they beat Cronulla. Clarke, who was in the Wigan team that famously won in Brisbane 25 years ago, says the Super League champions may need to draw on the spirit of '94 to get past Trent Robinson's men. 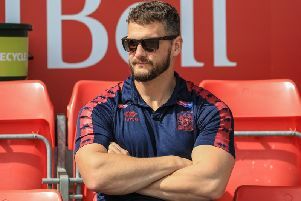 "The Roosters are favourites, but if all 17 Wigan players have their best ever game and they can all do it at the same time, then they have a chance," said Clarke, who appeared in three World Club Challenge matches. Clarke, who will be part of Sky Sports' coverage of Sunday's game, has a foot in both camps, having begun his career with home-town club Wigan and ended it in tragic fashion with the Sydney club. "I grew up with Wigan in my blood because my dad played for Wigan and I went when my mum was pregnant so I've been going there since before I was born," he said. "Obviously I was lucky enough to go on and play for Wigan and then had a wonderful experience with the Roosters." Clarke played for the Roosters in 1995, but broke his neck in the second match of the following season against the Cowboys in Townsville and, although he made a full recovery, his playing career was over at 24. "The club were so helpful to me and my family at what was a difficult time," he recalled. "Even though things didn't work out for me on the pitch, in terms of the mentoring they gave me as a husband, as a father and as a businessman, it was fantastic, it was like going to Harvard Business School.